Here’s how to install third-party, SPDL-based shaders, like alShaders, so that you can use them with SItoA. You could install them in a separate workgroup, but for simplicity I’m going to show how to install them in the SItoA workgroup. In these instructions, $AL_SHADERS is the location where you extracted the alShaders download. For example, C:\solidangle\alShaders\alShaders-win-0.4.0b18-ai4.2.0.6. $SITOA_WORKGROUP is the SItoA workgroup location. For example, C:\Users\StephenBlair\softimage\workgroups\sita-3.3.0-2014. Restart Softimage. The alShaders should show up in the Render Tree preset manager, and assuming that your version of alShaders is compatible with your SItoA, they’ll work in a render too. 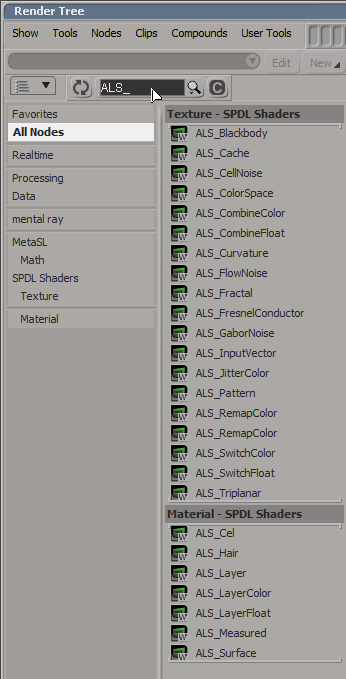 Tip Don’t create an alShader from the Arnold > DLL Shaders menu; it won’t pick up the SPDL and you’ll get a raw PPG (and a raw render tree node too). This entry was posted in alShaders, sitoa and tagged Shaders, Softimage by xsisupport. Bookmark the permalink.